Sagittarius, "The Archer," is one of the richest constellations in the sky, filled with numerous nebulae and clusters. The familiar "teapot" asterism, rotated clockwise 90 degrees, can be seen on the left side of the image. 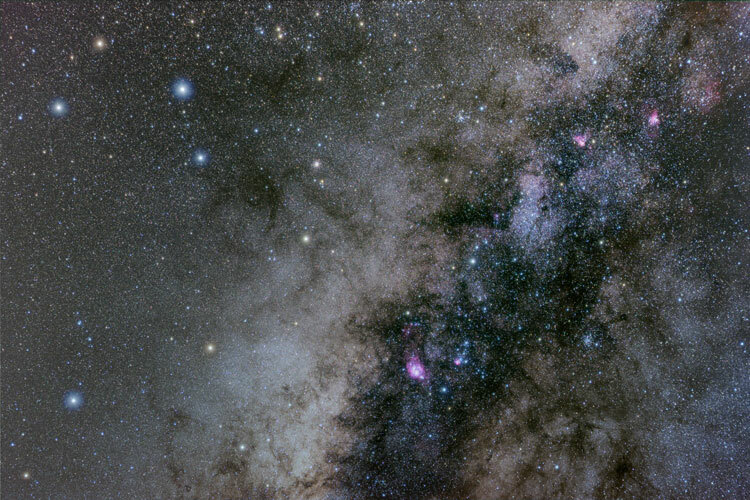 Sagittarius is located in the direction of the center of the Milky Way Galaxy. Among the objects visible in this image are M8, the large, bright red emission nebula just below the center of the image, with M20 and M21 to the right. The large, bright patch of stars right of center is M24, the Sagittarius Star Cloud. Extending above and to the right of M24 are the emission nebulae M17 and M16 (located in Serpens). Above and to the left of M24 is the open cluster M25. Below and to the right of M24 is the open cluster M23. Above Lambda Sagittarii, the "top" of the teapot, is the globular cluster M22, resembling a fuzzy "star" in this image. Technical Notes: Three exposures for each color were taken through a diffusion filter, which both enlarged the images and enhanced the colors of the bright stars. A second RGB image was created using these exposures, which was digitally composited with the luminance and unfiltered RGB exposures using the Lighten function in Photoshop CS2. Russell Croman's GradientXTerminator plug-in for Photoshop was used to remove mild light pollution gradients.